Let’s face it, we are social animals. Being forced to solitary living is considered a punishment and rightly so. As social animals we play, both as young and as adults. Play builds social skills, it makes sure our neurons are properly connected and it builds and protects our body. With ever growing focus on lifestyle and health comes ever new approaches to living healthy. Health is not just diet or exercise, it’s a lifestyle. The Paleo diet, which focuses on a natural human diet based on evolutionary and anthropologic data, seems to be here for good. And with paleo dieting came paleo living. Paleo living seem to fill a void, a longing for something less urban, something real. I believe he is correct and I believe that all around us we can see the results of people fighting it. Many new exercise trends focus on natural movements or movement patterns. The appeal to our primordial needs sell. Not only do natural movements sell and appeal, but so does natural surroundings to move in. No doubt our urban surroundings can be depressing and alienating. The walls are hard and unforgiving if met with force, the ground we walk upon equally so. Undoubtedly, the human animal is not well adapted to asphalt and steel living. We can smash our skulls open simply by falling from an upright position, and in an urban surrounding we often place our heads far higher than our bodies’ height. In other words, we brake easily and surrounding ourselves with metal and concrete might not be the best of ideas. We all like things soft. Of course we don’t feel good. 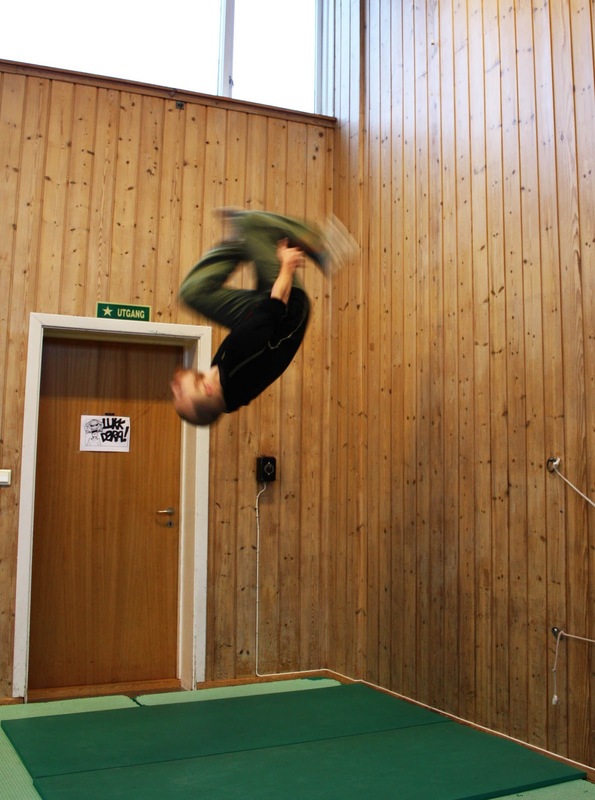 That, to the right is me, teaching local kids how to do a so called wall flip. I teach them Parkour, or at least I am there supervising while they run around. When a group of human youngsters, like those in my group, are given space to play in, equipment to play with and a few examples to follow, their behavior is strikingly similar to most other large group living mammals. It is a natural movement pattern utilizing all the movements of the body. They’re rolling, vaulting, climbing, jumping, crawling, falling, running, sliding and so on. Play will cause such diverse movement patterns because it is not stylized. The movements become natural because they’re dictated by biomechanical efficiency or the acute pleasure of doing that move. Those advocating exercise in the nature tells us to throw away our shoes, leap into the forest, find a log and toss it about. There is nothing natural about running on a rubber clad stationary treadmill followed by sitting in various contraptions pushing and pulling on metal and plastic. And the repetitiveness of it all might damage both our motivation and bodies. 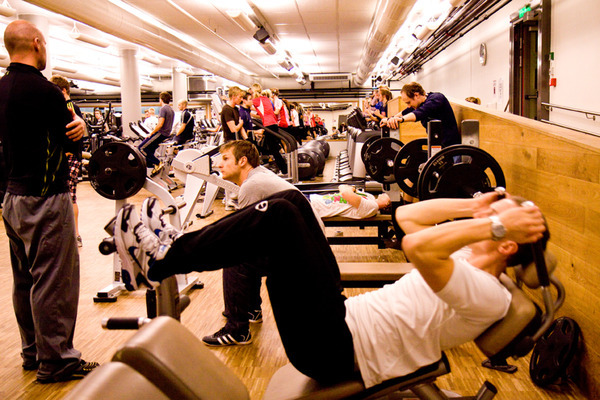 Because going to the gym does not appeal much to our more primitive needs or our mammalian instincts (except perhaps that it serves as a location for mating rituals where males swill strut like a Blue Bird of Paradise and the females assess the potential, or vice versa), it will easily make us bored. For many, it will feel meaningless and unfulfilling and the risk is high that any joy of exercising will be replaced by the joy of getting positive results at the expense of any personal pleasure of moving. Getting results is an external (extrinsic) motivation often directed at body weight, size, shape or function. These goals are to be reached in time and exercise is only a means to reach that goal. This motivation differs a lot from an internal (intrinsic) motivation, one that comes from the joy of exercising in itself and which is thus instantly rewarding. It does not require a very large step back and a bigger perspective gained for the tragicomic situation of fitness studio exercise to become apparent. Most social animals will to my knowledge play mostly as younglings, and play will gradually constitute smaller part of the day. It is the same with us humans. When we are young we are allowed to play, encouraged even to move with no apparent meaning or goals other than the share joy of moving. As we age, physical activity is gradually stylized, systematized and organized. We join sports, often competition sports where the main goal is performance. And we no longer call it play – it is far too serious to be called play. So when we are young we play, but when we grow up we have to call is exercise and we often do it even when we don’t want to. This lack of play in modern forms of physical activity goes very well with our mechanistic view of the human body. Focus should be on fat burning, muscle growth, body sculpting, VO2max, lactate threshold and all the rest. We no longer exercise the body, we exercise tissues. When our Parkour training starts, in no way do I have to tell the kids to start exercising or to motivate them to start. I have to hold them back. I have to hold them back so I don’t suddenly find one of them hanging under the roof without something soft to land on. There is an inherent drive to play in us, so strong it is hard to control and it is most obvious in the young. And why should we control it? In these sessions no one lies down doing sit-ups to get six pack abs. They roll, run, climb, hang, crawl and within minutes have activated most of the skeletal muscles in the body. It’s like letting your dog run and play with other dogs – when it is play time there is no stopping the playful instinct. Mark Sisson knows the importance of play and advises us to go on imaginary hunts for joggers. I’m sure it’s good advise although I am somewhat afraid that one can easily get carried away and suddenly find oneself sitting on top of a panic-stricken jogger, heart racing with pure adrenaline joy. No motivation for exercise is all intrinsic or extrinsic. Even if we really enjoy the exercise in itself we most often have external goals driving us. The problems occur when the scale gradually tips in favour of external rewards. In no way am I suggesting that we are not playing. There is lots of play out there and all is not stylized and boring. I believe that many of the smaller physical activity trends have emerged because of a lack of play in traditional sports. Skateboarding is a prime example. In the beginning of skateboarding it was all just for fun. No rules, no competitions, just the board, the wheels, your shoes and your body. Snowboard is an equal example from winter sports. Unlike most forms of skiing it was all for fun. No rules. Just play. In the water the board to play with can be a surfboard, wakeboard or any other floating device. Play does not, however, exclude competition. One of the fastest growing sports in the US is Ultimate Frisbee. It is a playful activity indeed. Frisbee golf is also great fun and even more fun with some competition (even better with a cold beer halfway in). Many such exercise trends have emerged and seems to me to be emerging in increasing numbers. The trend is great and YouTube is overflowing with examples of skilled people exercising for the fun of it. An interesting aspect with some of these new play-based exercise trends, is that they have in them something other than the activity itself and something other than results and play. It is not about our bodies, but our surroundings. 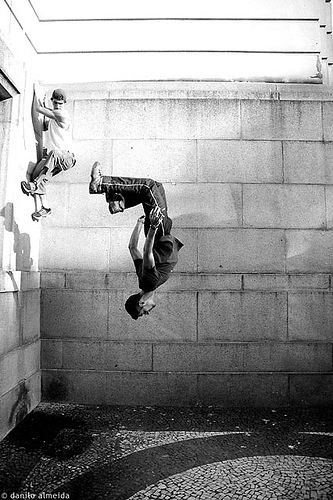 When the traceur (Parkour performer) (or a skateboarder for that matter) is running around in the city he is taking back his alienating surroundings. He is making the concrete jungle* his jungle. We are being estranged by our very homes, we don’t feel good and we don’t much want to move when everything is so bloody hard. But where the average person sees a wall and a blocked path the traceur sees a challenge. If our surroundings are hard then we’ll be soft. There is no need to take of your shoes and look for the nearest forest. It is not our surroundings that that make us behave naturally. Although it may help, we do not need trees or grass to stimulate play and natural behavior. An alien watching chimps play in the forest and kids playing in the urban jungle would have a hard time differentiating the species. One covered in hair, the other by fabric. You can take the human out of nature, but you cannot take nature out of the human. Any ground is our playground. *Urban jungle is perhaps not a good term. A city is nothing like a jungle. Humans evolved living in small groups, small enough for an individual to properly know all other individuals of that very group. A city may be comprised of hundreds of thousands and even millions of people. The only way for an individual to retain his mental health is to form small subgroups (tribes) and to consider everybody else part of the background. So one major reason to seek forest exercise is to avoid the social overkill of city living. To take a break – to be distracted. And distraction is indeed one of the most important reasons why physical exercise makes us feel good.